waw really unique and super cool outfit! Great. and I do love the bracelet! I’m in love with your clutch and shoes! The skirt looks great ! Gorgeous outfit, my dear ! I love the pop of colour here. The neon blouse is gorgeous – and I need that necklace!!! You did really well modeling those bracelets. Blouse colour <3 my favourite! Fab look!Love the clutch and the necklace! What a great outfit ! Your yellow blouse is very pretty and this color suits you very well. Awesome outfit! I love this bright yellow shade. amazing outfit! i love everything! Beautiful colors and their combination! That clutch os amazing, I love the colour. The look is awesome, I love the way you combined things! You are such a good source of inspiration! Have a nice day! You honestly do neons better than anyone else! And loving the Poshlocket Project bracelet – so beautiful. 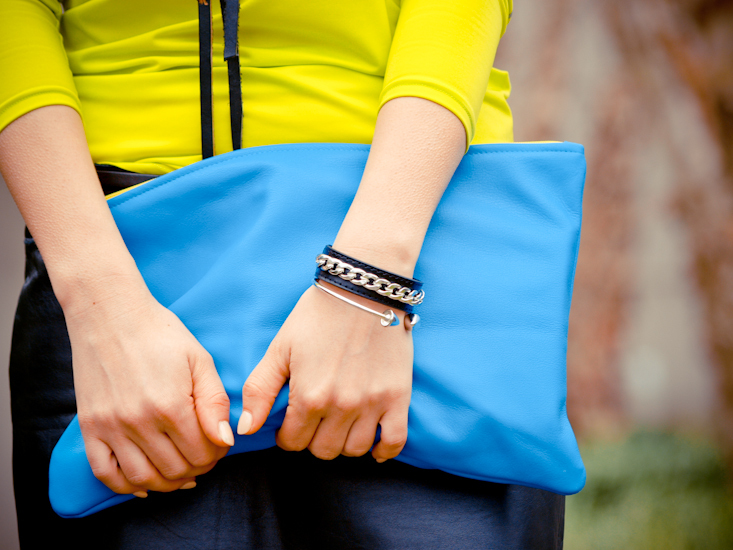 You’re a gorgeous pop of colour, perfectly accessorized! Love the shoes! The mix of the colours is amazing! wow u always look uber chic!!! loved the post….lovely!! wow u always look uber chic. love the post…just lovely!! Super cool look!It has a futuristic vibe to it! lol I love your top! I love the colour of the Blouse! Love this style, you look awesome! Just discovered your blog! Love it! Hey, great outfit! I love those cat-eye-sunglasses and the leather skirt combined with yellow :). The colors in this outfit are amazing! Gorgoeus! I am in love with your shoes! I really, really love your hand-made necklaces! Have you ever thought about making them for sale? This one is such a beautiful, statement piece! Wow i love the top, the colours are amazing !! Omg those shoe! I’m in love! Ce cool e colierul, se incadreaza perfect in tinuta! Sa ai un weekend superb, te pup! I love this outfit! This leather skirt associated with this yellow sweater looks gorgeous!